As the cold melts away and flowers start to bloom again, Whidbey Island is blessed with a rare and wonderful gift. Many people hike to the very tip of a bluff or edge of the waves hoping to catch a glimpse of this phenomena. Then it happens – water spurts into the air from nowhere and at the surface you can just barely see a tail appear. Oh, what a whale of a tale to tell…. Spring brings with it a special excitement for this curious island. 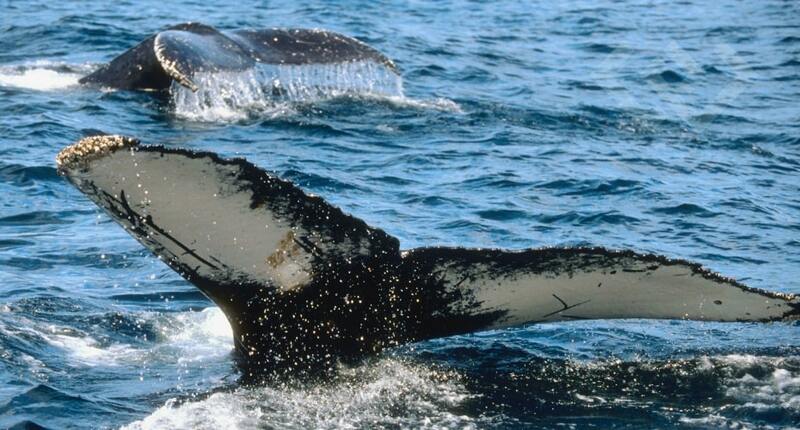 As the waters warm, they welcome back one of our favorite travelers; the gray whale! 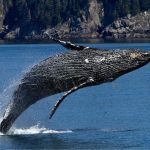 Migrating every year from their winter home in Mexico to the wild waves of Alaska; gray whales often make a special stop within the waters of the Puget Sound. Given their foraging requirements, gray whales’ proximity to the shore and repetitive presence in the Puget Sound comes as little surprise. While the average depth of the Pacific Ocean is a little over 12,000 feet, Puget Sound’s deepest point is approximately 930 feet. The shallow waters of the sound serve as a great benefit to this massive mammal that relies on both oxygen and access to the ocean floor in order to survive. On Whidbey Island we take great joy in the return of these travelers every year. Many islanders and tourists alike find their way to the water’s edge and peer into the waves in hopes of a glimpse. Luckily, sightings are not at all uncommon on the island. To commemorate the love we have for these ocean friends, both Coupeville and Langley have erected what is called a “Whale Bell.” These bells have a simple instruction: “See a whale, ring the bell.” These bells serve as both a monument to the whale’s impact on our island culture and a creative way to notify others of the whale’s presence so they can also look out and see! If a bell simply isn’t enough and you really want to get your whale on; you might consider taking a trip to Langley April 13th & 14th for the Whale Festival. Every year the town pulls together to commemorate the beginning of the whale season. Complete with a Saturday parade, this festival speaks volumes of the love islanders have for their precious whales.